Geʽez has 26 consonantal letters. Compared to the inventory of 29 consonants in the South Arabian alphabet, continuants are missing of ġ, ẓ, and South Arabian s3 (Geʽez Sawt ሠ being derived from South Arabian s2 ), as well as z and ṯ, these last two absences reflecting the collapse of interdental with alveolar fricatives. On the other hand, emphatic P̣ait ጰ, a Geʽez innovation, is a modification of Ṣädai ጸ, while Pesa ፐ is based on Tawe ተ. ^ Gragg, Gene (2004). 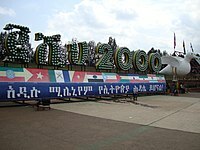 "Geʽez (Aksum)". In Woodard, Roger D. The Cambridge Encyclopedia of the World's Ancient Languages. Cambridge University Press. p. 431. ISBN 978-0-521-56256-0. This page was last edited on 8 April 2019, at 21:26 (UTC).